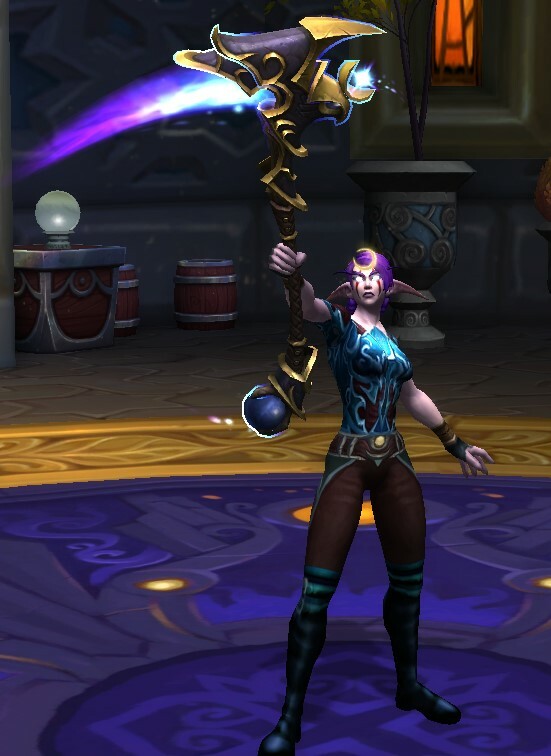 There were a few mage tower appearances I really wanted, and I’m so happy to say I actually got them the ones I wanted. 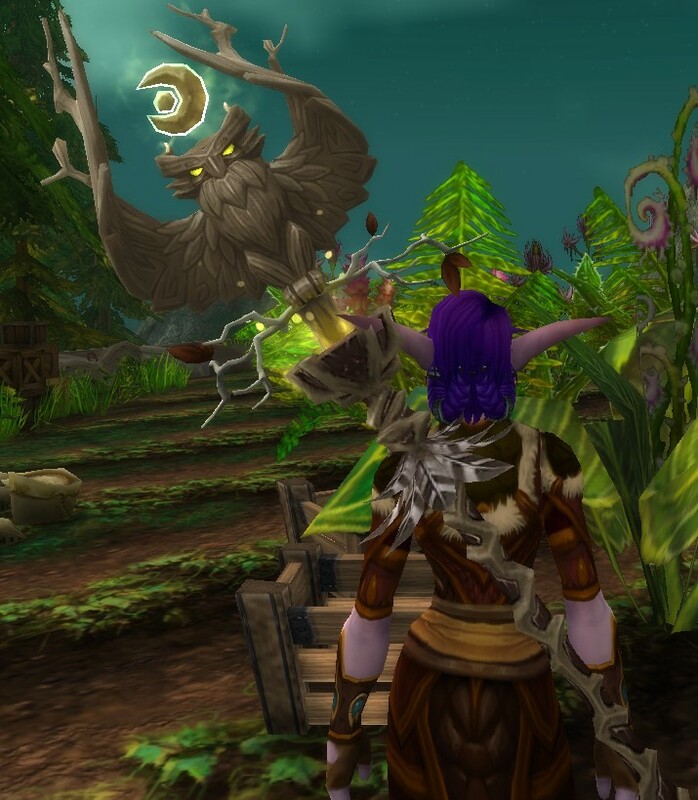 The first one I really wanted and that I was pretty sure would be the only one I collected was the Druid’s Owl staff. It’s simply stunning I couldn’t even consider transmogging away from it for quite a while. The healing challenge is pretty long and most of my Druid’s wipes were in the final phase so I’d have big gaps between attempts because I didn’t want to have to start it all over again. Eventually I got it though and I’m so glad because it is really unique. 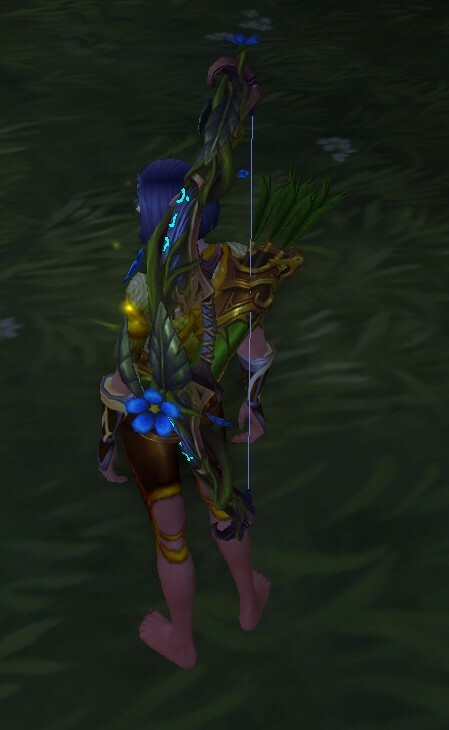 The only other appearance I was desperate to get was the Marksmanship Hunter’s floral bow. I didn’t really decide I wanted this bow until only a few weeks ago and my hunter was sitting at 870ilvl. I spent a few weeks running her through mythic plus and LFR and all the world quests that gave upgrades until I got her to around 915 and started taking her in. I had played MM at the start of the expac so at least the spec wasn’t brand new but it took quite a few goes to get my head around kiting the mobs. All the guides said you could avoid the little adds and didn’t have to kill them but I’m obviously a slow hunter and the little adds would catch up to me all the time. I ended up taking a non-recommended AOE talent and it got a lot easier as the adds would die and I didn’t have to worry about them anymore. I was really close to being able to kill it when the artifact was boosted, so it was a super easy one shot when I went in there with all my traits. Balance Druid had the same scenario as MM, so I figured since I knew the fight I’d pop in and collect the Boomy appearance. It was much easier on my druid even though she didn’t have the slow that my hunter had, and she also had the advantage of being about 20 ilvls higher. It was actually quite interesting doing the same fight on a different class and seeing how each class’ spells and toolkits had to be used to defeat the same boss. 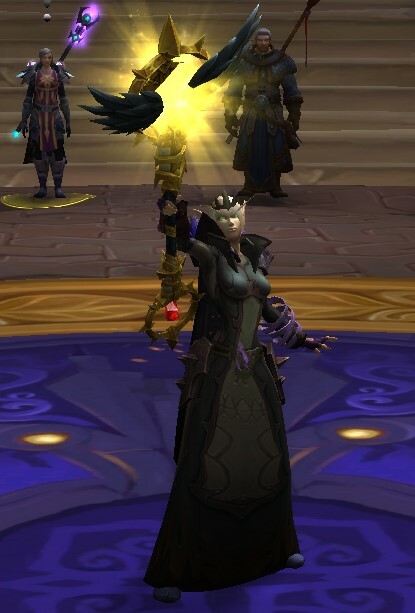 I decided on a whim to take my holy priest through the healing challenge and collect her staff. It wasn’t one I really wanted, but I figured since I knew the healing challenge so well from taking Zee through it over and over, I may as well see how the priest went. Holy hell, the priest was so much easier than Zee. They both had the same ilvl when I did and much the same traits unlocked but the priest could interrupt every time she needed so the first phase was much easier and the stronger direct heals rather than slower hots made the final phase a bit easier too. The priest still had a few wipes on the final healing the adds as they walked to the boss bit, but nowhere near as much as my Druid did. This challenge actually has made it even harder to choose between playing Druid or Priest as main next expac. 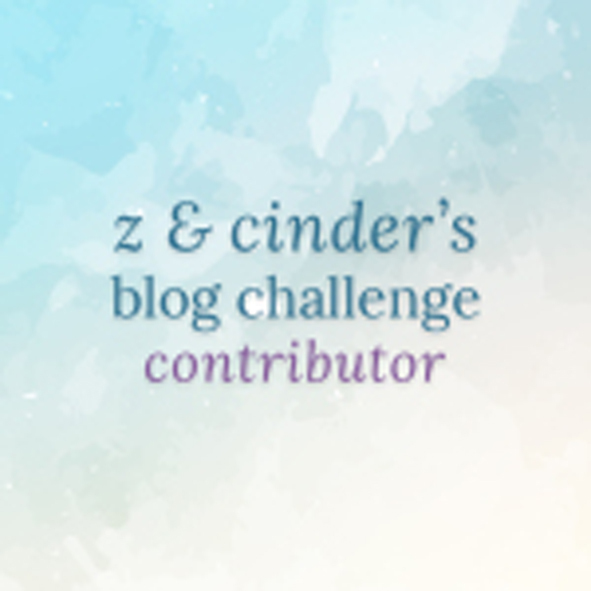 Then Cinder posted on Twitter how she had picked up the Feral Kitty skin and I had a closer look and realised it was actually really pretty so I popped into the Feral challenge. 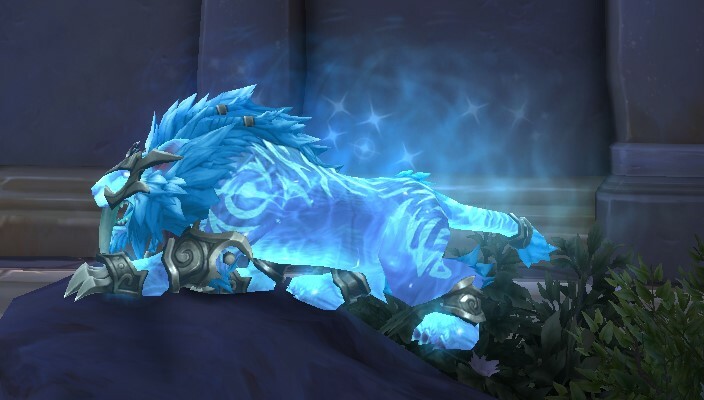 It took less attempts than any of the others to defeat which I was really surprised about seeing how little I play Feral but the abilities I had seemed to make that challenge really smooth. 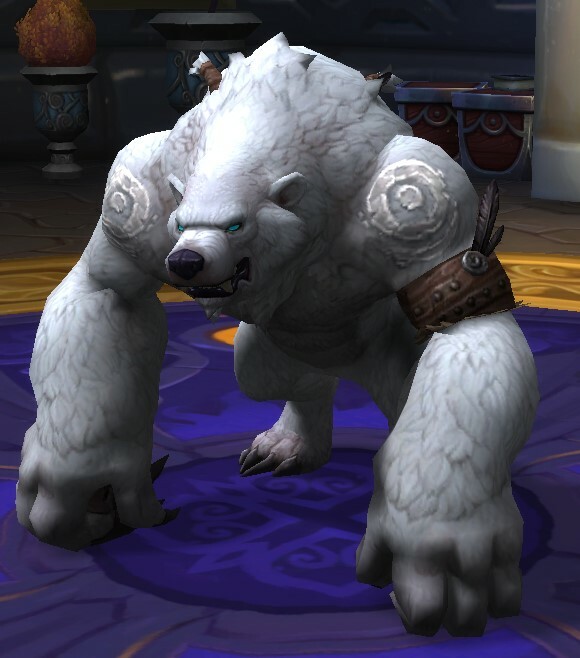 Guardian wasn’t even on my list of wanting to get as I think the Gorilla bear is actually quite ugly but it made sense that I should try to get all the appearances for Druid. Guardian is the one spec I don’t even touch and I’ve hardly tanked in general so I was learning a role and a spec all at once and boy was it a steep learning curve. I could definitely see progression each time I’d try and on my best attempt I got Kruul down to 22%. I think it probably would have been doable but maybe not in the timeframe before pre-patch so I had a friend pop in and give me a hand. 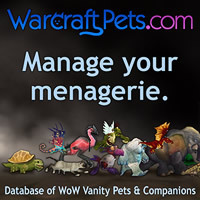 I only feel a little guilty I didn’t do it myself, because now at least I can spend the last weekend before prepatch wrapping up some Legion loose ends instead of locked in the mage tower. 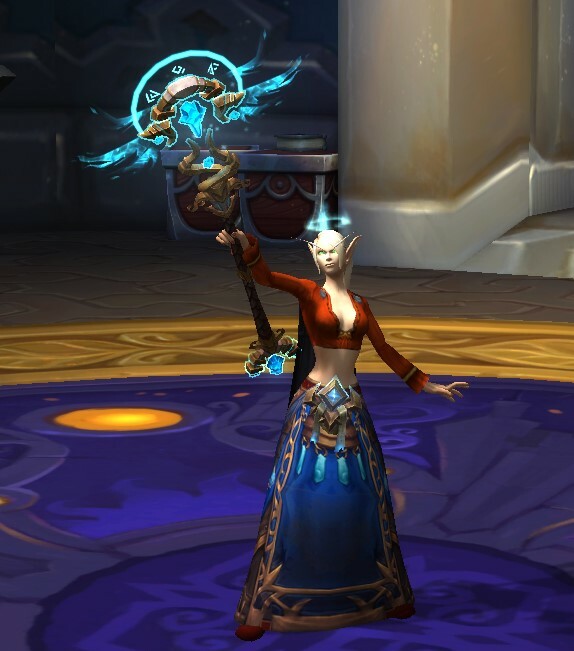 Edit: Opps I posted too early because apparently the lure of the mage tower is too strong and I popped in there again on my priest to see what the Disc challenge was like. I haven’t even looked at Disc before so really wasn’t expecting much and I had enough shards for 12 tries but managed to get it in 6! It wasn’t actually that bad at all, keeping a shield on myself and using shadowmend to keep a 10% damage reduction on myself worked the best for the final attempt and it went ok. It felt slow but one I figured out what to dodge and to make sure the fel totem was targeted with an instant cast dot, I stopped getting stunned and could concentrate on dpsing. Disc was so much fun in the mage tower challenge, I wish I had tried the spec out for real during Legion. I actually hope they do bring something like the mage tower into the game for BFA. I wasn’t very sold on the idea of the mage tower when it first came out and there weren’t really that many appearances I really really wanted so I didn’t feel I had a reason to learn how to do the scenarios on multiple toons but in the end it was really interesting doing the ones I did and seeing just how each class approaches the same fight in a such a different way was pretty cool. If they do bring something like this out again, I think I’ll make more of an effort to at least take all the classes into it a couple of times just to see how they each approach the same fight.